Hatters boss Nathan Jones has confirmed that midfielder Glen Rea could face up to a month out after damaging his knee ligaments in training this week. 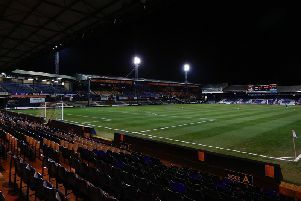 The 22-year-old was expected to start against Crawley Town yesterday after his impressive appearance from the bench during Luton’s 2-1 defeat to Grimsby Town last weekend, but wasn’t included in the match-day squad. It has opened up his medial (ligament) so that could be anything from seven days to four weeks. On his absence, Jones said: “Glen picked up a knee injury. “We hope it’s not too bad, (it was a) block tackle in training, innocuous. “It has opened up his medial (ligament) so that could be anything from seven days to four weeks. “We’re hoping it’s closer to seven days, so that we could get him back.